The elbow is a joint that consists of three bones - the humerus (upper arm bone), radius (forearm bone) and ulna (forearm bone). 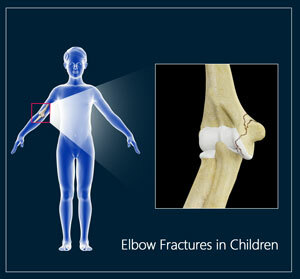 An elbow fracture most commonly occurs when your child falls on an outstretched arm. It can lead to severe pain in the elbow and numbness in the hand. Fractures are more common in children due to their physical activities as well as their bone properties. Children's bones have an area of developing cartilage tissue called a growth plate which is present at the end of long bones that will eventually develop into solid bone as the child grows.